It seems B has taken another step forward since its third issue. Its English edition has made a head start in overseas sales. It is overwhelming to take another step forward to inch toward the magazine’s goal to offer contents targeting the global market. 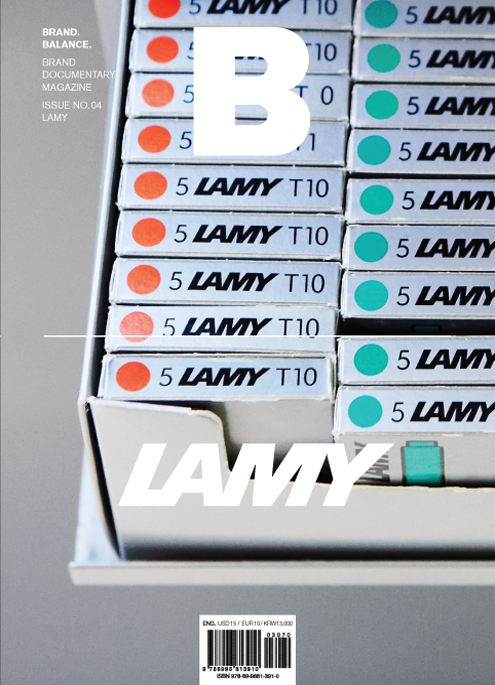 The brand that B has selected for its fourth issue is the German pen maker “Lamy.” My first discovery of Lamy still remains vivid in my mind even to this day. I looked around numerous stationary stores, in a search of the perfect fountain pen for myself. 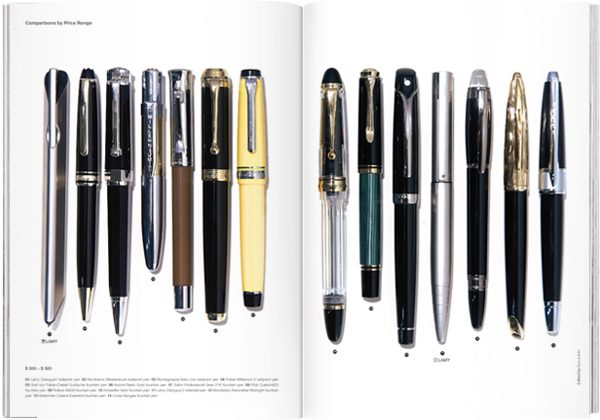 I had previously received fountain pens as gifts on numerous occasions, but I must confess, the fountain pen brands I had known were mostly established pen makers such as Montblanc and Waterman. 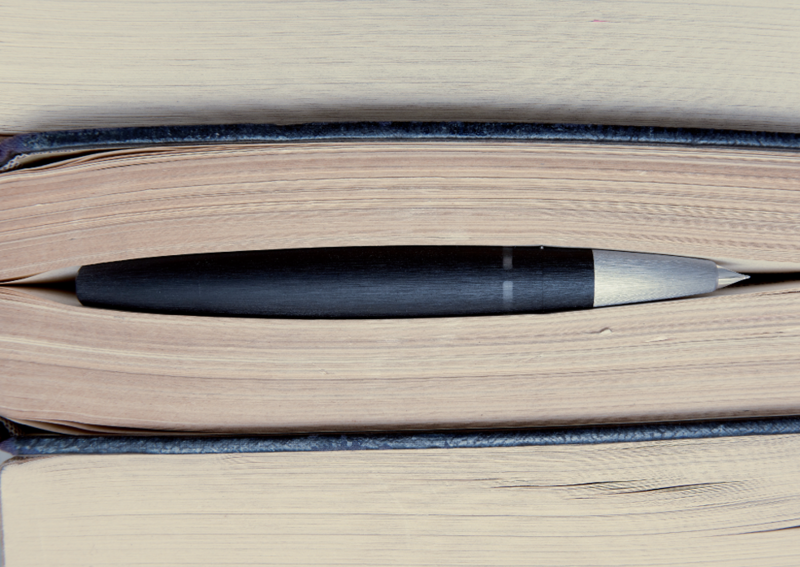 LAMY, on the other hand, came as a shock to me – its modern design paired with variety of colors opened my eyes to a whole new realm of fountain pens. It has been more than a decade since then, and I have held countless number of pens in my hand. I have also been personally interested in writing instruments, but my first impression of LAMY remains unchanged. 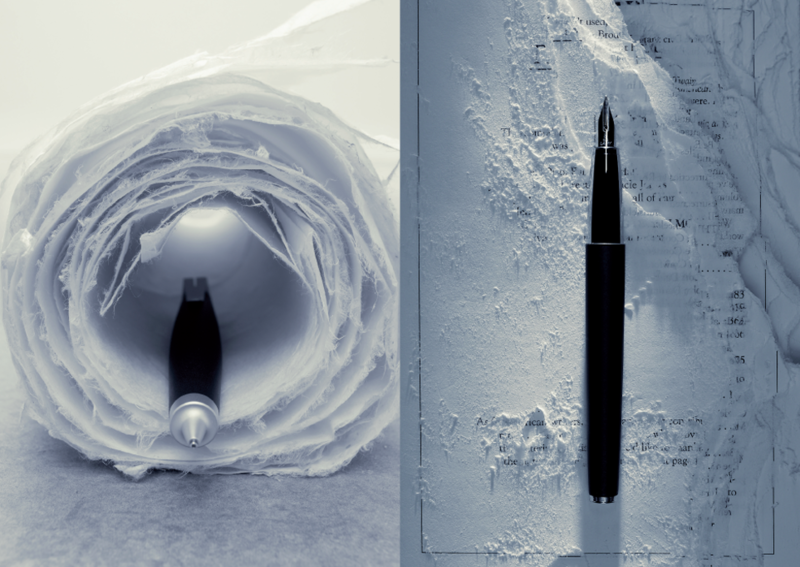 Mr. Min Kwon, the editor-in-chief of UNITAS BRAND once commented that while a Mont Blanc fountain pen “gently glides” on paper, LAMY pen “softly scratches” the paper. 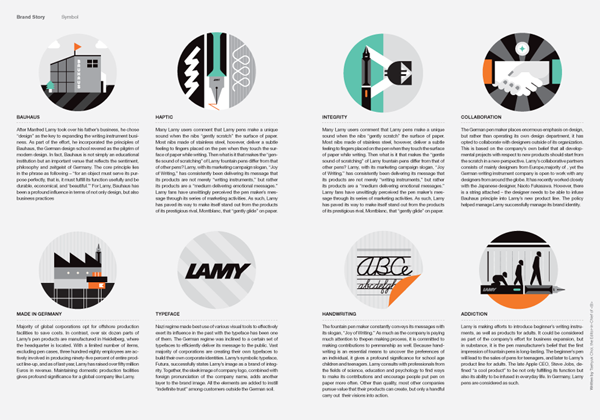 It was indeed adequate to describe the brand image of LAMY which offered its product line of everyday writers. Although prestigious brands with long history may take up the majority in writing instrument industry, LAMY has consistency and sincerity in its approach toward what is usually perceived as an “old and conservative” image of fountain pens and successfully brought forth writing instruments with a young and sensuous image. I suppose Mont Blanc fountain pen users, users of colorful LAMY Safari pen, and those who grab any pen and end up losing it afterwards have very little in common. One's choice of writing instruments can give “clues” about his or her taste. 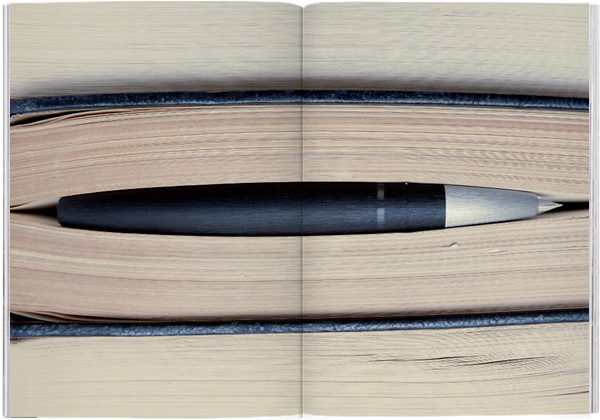 Similar to what a desk can tell about a person, a writing instrument can hint at so many things. To such extent, B is going to take a closer look at the creativity and consistency that LAMY has unleashed with its devotion to making high quality writing instruments paired with unique designs and acceptable price range. In fact, fountain pens are primary writing instruments that let water soluble ink flow to leave its traces on papers. Fountain pens demand users to take a quick look at the angles of nibs during use. In fact, they are quite difficult and somewhat inconvenient to use because users are constantly need to maintain a subtle balance when putting their pens on paper. In spite of all this, fountain pens are and will always be appealing to and be cherished by many as sophisticated writing instruments. With technology evolving, new writing instruments are being developed for use - even in spacecrafts - and digital gadgets are rapidly replacing handwriting instruments. Nevertheless, fountain pens will continue to be cherished deep inside people’s hearts for many years to come. Keyboards and touch panels are increasingly used in place of pens these days. I sincerely hope that this issue will motivate readers to pick up their fountain pens, though not necessarily LAMY pens, to retrieve the long forgotten joy of writing. We always write something, On clean sheets of paper, with pens and ink. Gravity slowly pulls down ink to flow and leave traces on paper, And nibs give a genuine sense of pressing pen against paper. That’s how handwriting is done. This celebrity commercial film director, who has been a long-time LAMY Safari user, comments that the fine and smooth nib is perfect for writing lyrical and delicate works. She feels that her pace of writing is dependent on the writing instrument she is using; Monami’s Plus Pen, a disposable fine liner made by a Korean company, writes smoothly, making her handwriting look like a sketch, whereas LAMY pens slow down the pace and make her handwriting look neater. 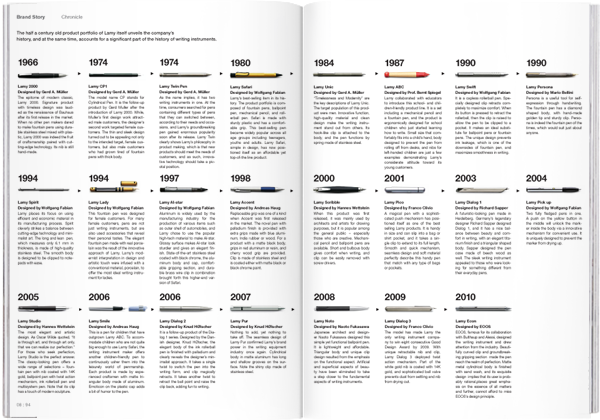 Every part of Lamy pens - nibs, grips, clips, ink, converters, cartridges, and graphite just to name a few-urged the magazine staff to examine it in detail. 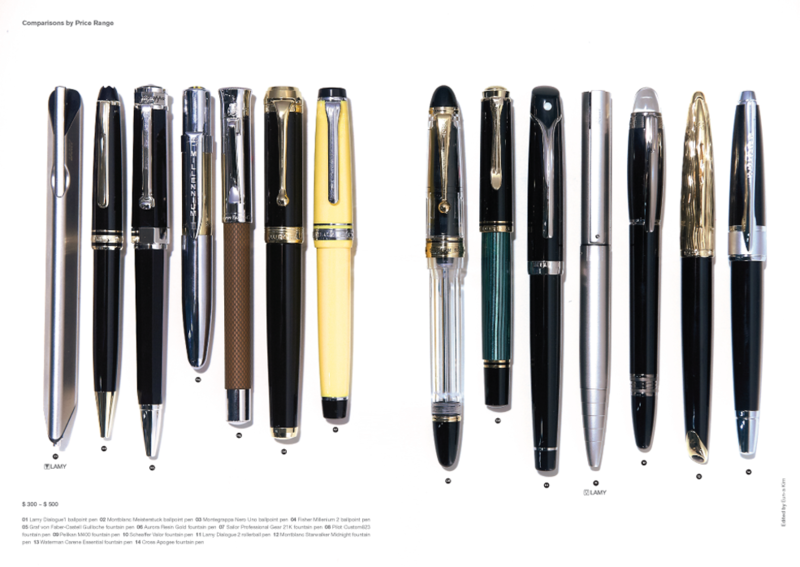 These pens were in the hands of numerous staff members for writing, clipped to folders to be carried around, and used to write on different kinds of notepads, and they even had ink refilled with converters – all these were part of the magazine’s efforts to truly experience and understand Lamy pens. 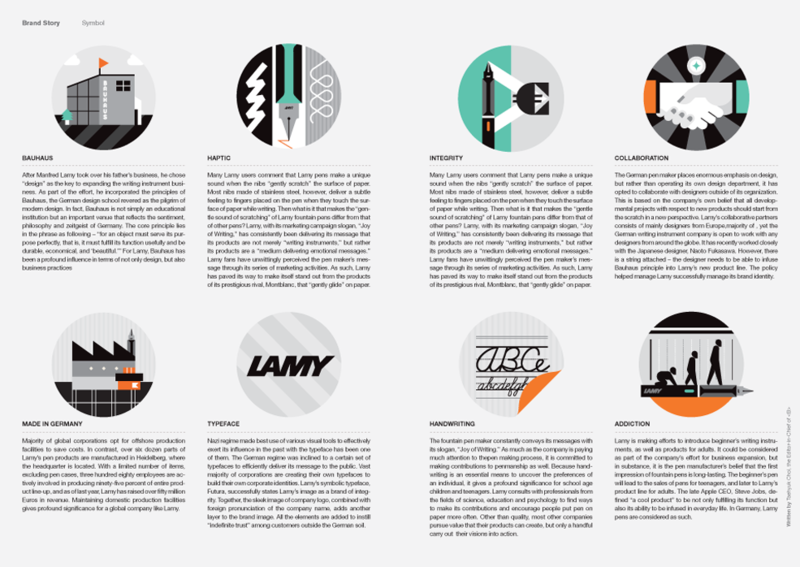 All readers are now welcome to explore the essence of Lamy. His Lamy pen has always been with him. He wrote his wedding invitation cards with it and now, he uses it to write in his baby book. He revealed that he has been a long time user of LAMY pen ever since childhood and explained that German children either have LAMY or Pelican pens when they first go to school. When asked about Lamy, most of their avid fans stated, “It looks like a design product,” or “It’s a fountain pen, but an easy-to-use fountain pen.” Another aspect these fans share in common is that they all enjoy handwriting. For them, Lamy pens serve as a daily writing tool for signing important documents or jotting down their ideas on notepads, and as a precious gift item for loved ones. B spared some time and space to share the stories of their first experience with a Lamy pen, with a curious look at what were being written. Lamy pens come in a wide variety of designs and colors. 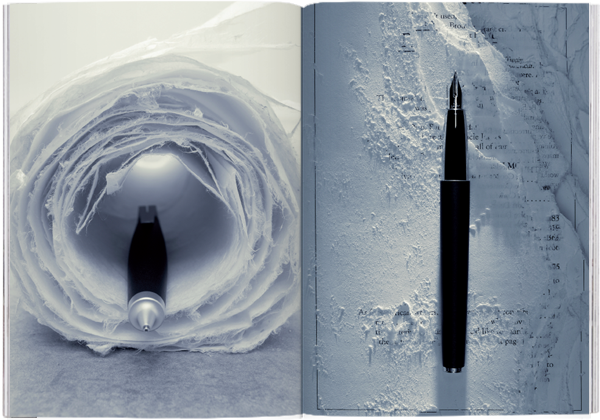 What could be deemed an appearance of conscious pen maker, Lamy, however, maintains its sincere attitude towards putting pen on paper. 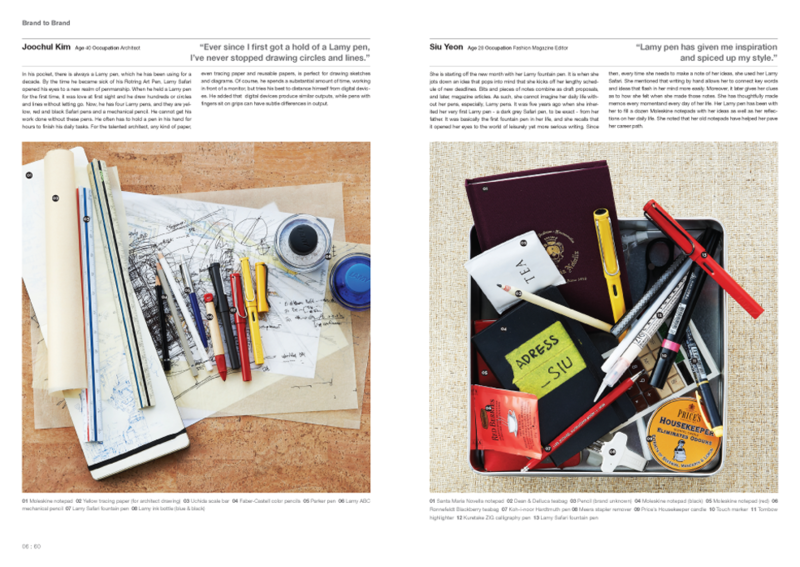 Lamy’s published book titled “The Joy of Writing” hints at the very essence of the pen maker’s philosophy. Lamy’s elegant pens, in fact, serve as a medium conveying this idea and sentiment. Commitment to offer products with modern design for anyone who enjoys handwriting – that is the pivotal axis of Lamy’s brand philosophy. 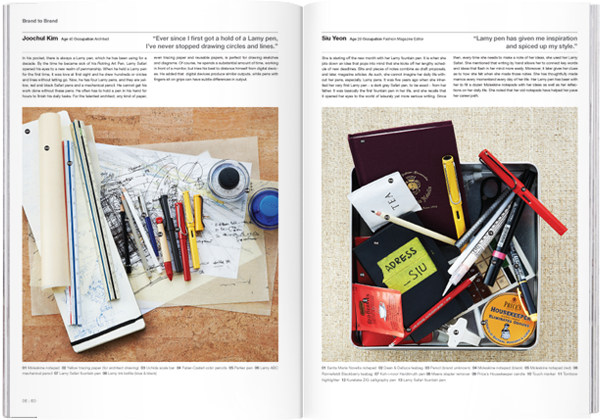 In this issue, B attempted to uncover Lamy’s modernist interpretation of primary writing instruments. 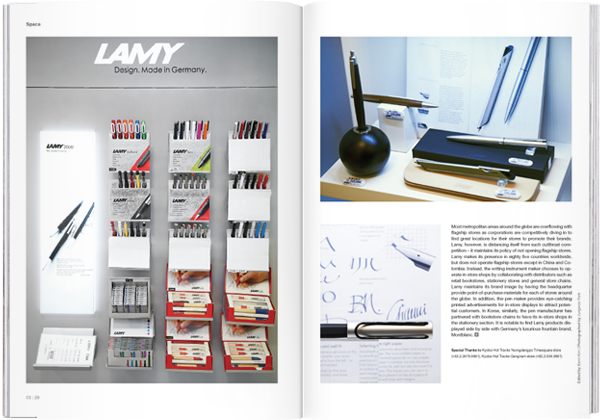 German pen maker, LAMY, first started as an Orthos fountain pen maker in 1930 and established its own brand in 1948 before growing into a globally renowned German brand. LAMY has been greatly inspired by Bauhaus, which was in pursuit of balance between function and form. 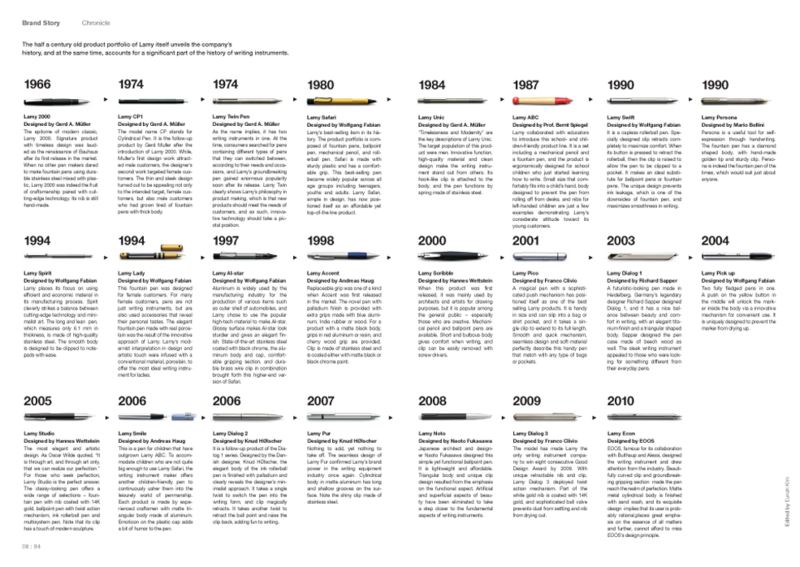 In 1966, the pen maker introduced its signature product, Lamy 2000 and began to pave its way to become what is perceived as “genuinely Lamy” today. 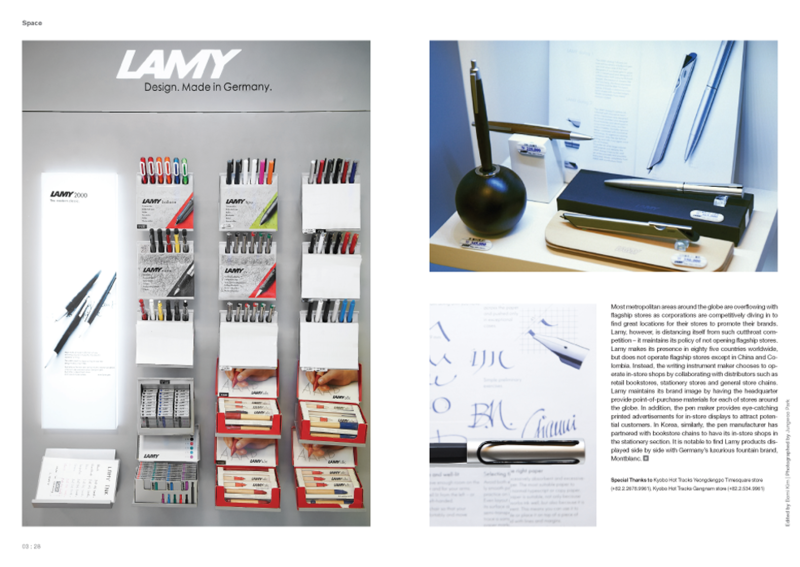 The founder of LAMY, Josef Lamy, was succeeded by his son Manfred Lamy and later, Bernhard Rosner in 2006. The magazine had a close look at Lamy’s corporate strategy through the pen maker’s former and current CEO’s comments made during media interviews. 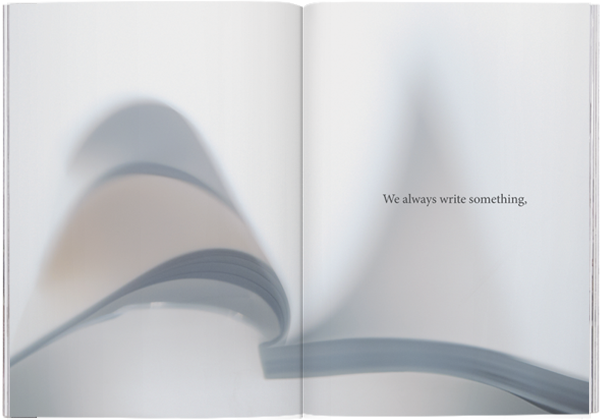 We are constantly writing - about ourselves and the present moment. Everything changes, technology evolves. 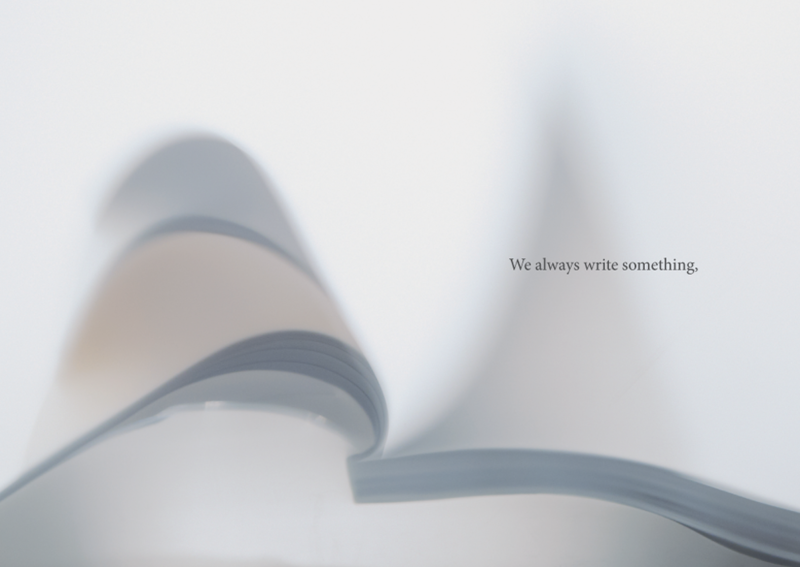 But the only thing we need is a solid piece of pen to write with, a reliable pen that will last a long time, helping us feel the joy of writing. A pen to call our own.